From the North or South: Take the A39 to Trekenning Roundabout and take the exit to St. Columb Major. 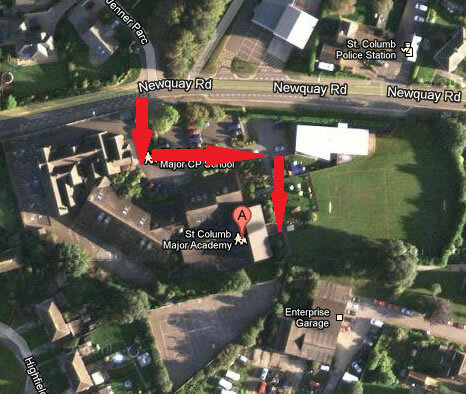 Continue along Station Road for about half a mile and then turn left into Newquay Road. The entrance to the Academy is approximately 175 yards on the left. From the East: Take the old A30 from Roche / Victoria and continue over the new A30, past Castle An Dinas, for about 3 miles until you reach the Trekenning roundabout. From the roundabout, follow the instructions above. From the West: Approaching the A39 along the A3059 (past Newquay / St. Mawgan airfield) take a left turn sign posted to St. Columb Major into Newquay Road. Proceed just over half a mile to the entrance to the academy on the right. From the entrance to the academy, follow the road round to the left and park in the car park on the left. Walk towards the far end of the car park and then take the path on the right, enter the last classroom on the right.